This card can only be Special Summoned by removing 1 LIGHT and 1 DARK monster in your Graveyard from play. Once during each of your turns, you can select and activate 1 of the following effects: ·Remo.. This card cannot be Normal Summoned or Set. 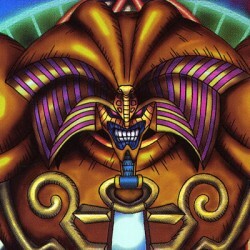 This card cannot be Special Summoned except by the effect of "Contract with Exodia". This card is not destroyed as a result of battle or by the effects of S..
You can flip this card into face-down Defense Position once per turn during your Main Phase. When this card is Flip Summoned, return all monsters on your opponent's side of the field to the owner's ha..